→2007MY: Replacement every 60,000 miles. 2008MY→: Replacement every 93,205 miles. →2003MY: Replacement every 60,000 miles (tensioner pulley must also be replaced). 2004MY→: Replace timing belt every 80,000 miles. 2004-2006MY: Replace timing belt every 80,000 miles. 2007MY→: Replace timing belt every 100,000 miles. 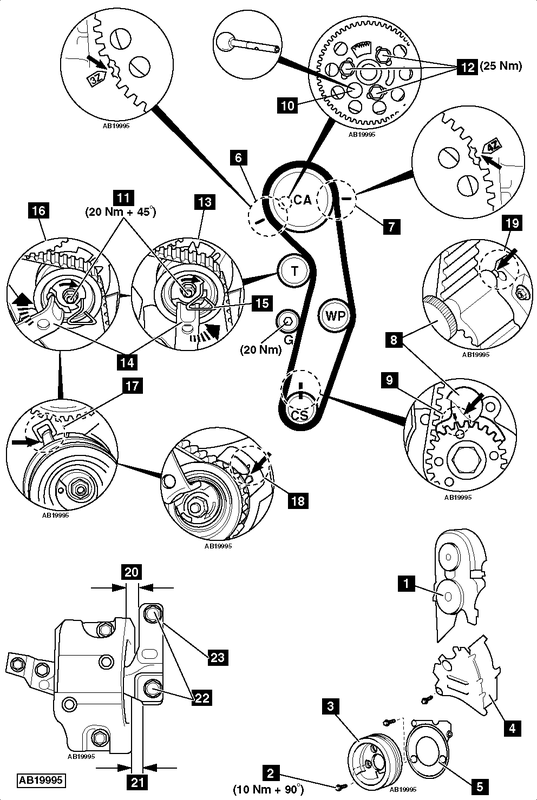 →2003MY: Replacement every 40,000 miles (tensioner pulley must also be replaced). 2004MY→: Replace timing belt every 60,000 miles. Replace tensioner pulley every 120,000 miles. Replace timing belt every 60,000 miles. Camshaft locking tool – Volkswagen No.3359. Camshaft sprocket holding tool – Volkswagen No.T10172/4. Crankshaft sprocket locking tool – Volkswagen No.T10050. Two-pin wrench – Volkswagen No.3387 or T10004 or T10020. Golf/Bora: RH headlamp (if required). Turbocharger/intercooler air hose(s) (as required). Lupo: Mass air flow (MAF) sensor. RH wheel arch liner (if required). Auxiliary drive belt. Use tool No.T10060. Auxiliary drive belt tensioner (if required). Golf/Bora/Beetle: Coolant expansion tank. DO NOT disconnect hoses. Golf/Bora: PAS reservoir. DO NOT disconnect hoses. Lupo/Golf/Bora: Detach fuel pipes from cylinder head cover.WARNING: Fuel may be under high pressure and very hot. Polo: RH engine mounting intermediate bracket. All other models: RH engine mounting. 3 cylinder engines: 3Z  . 4 cylinder engines: 4Z  . NOTE: Notch located behind camshaft sprocket teeth. Lock crankshaft sprocket. Use tool No.T10050  . Lock camshaft. Use tool No.3359  . Slacken camshaft sprocket bolts  .NOTE: Slacken bolts until sprocket can be moved within slotted holes. Turn tensioner pulley anti-clockwise until locking pin can be inserted  . Use tool No.3387  . Turn tensioner pulley fully clockwise until it reaches stop  . Use tool No.3387  . Ensure camshaft locked with tool  . Ensure crankshaft sprocket locking tool located correctly  . Turn camshaft sprocket fully anti-clockwise in slotted holes.NOTE: Sprocket should turn freely without tilting. Turn tensioner pulley anti-clockwise  until locking pin can be removed. Use tool No.3387  . Turn tensioner pulley slowly clockwise until pointer aligned with notch  . Use tool No.3387  .NOTE: Belt adjustment must be carried out when engine is cold. Tighten tensioner nut  . Tightening torque: 20 Nm + 45°. Hold camshaft sprocket. Tool No. T10172/4. Tighten camshaft sprocket bolts  . Tightening torque: 25 Nm. Crankshaft sprocket locking tool  . Fit crankshaft sprocket locking tool while slowly turning crankshaft to TDC  . Tool No.T10050.NOTE: If turned past TDC, turn crankshaft 1/4 turn anti-clockwise and repeat above procedure to fit crankshaft sprocket locking tool. Ensure tensioner pulley pointer aligned with notch  . Ensure camshaft locking tool can be inserted easily  . Tool No.3359. Remove lug of crankshaft sprocket locking tool from hole in oil seal housing. Turn crankshaft until camshaft locking tool can be inserted  . Tool No.3359. Turn crankshaft clockwise until lug and hole aligned. Remove locking tools  &  . Fit crankshaft sprocket locking tool while slowly turning crankshaft to TDC  . Tool No.T10050.NOTE: If turned past TDC, turn crankshaft ¼ turn anti-clockwise and repeat above procedure to fit crankshaft sprocket locking tool. Tighten crankshaft pulley bolts  . Tightening torque: 10 Nm + 90°. Sharan: M8 bolts – 30 Nm. M10 bolts – 45 Nm. Bolts securing engine mounting to engine bracket – 40 Nm + 90°. Use new bolts. Lupo: Tighten engine/gearbox steady bar. Bolts securing steady bar bracket to gearbox – 40 Nm + 90°. Use new bolts. Bolt securing steady bar to bracket – 90 Nm + 90°. Use new bolt. Bolt securing steady bar to subframe – 90 Nm + 90°. Use new bolt. Bolts securing intermediate bracket to engine bracket – 30 Nm + 90°. Use new bolts. Nut securing intermediate bracket to engine mounting – 40 Nm + 90°. Use new nut. Engine mounting clearance  : 14 mm. Engine mounting clearance  : 10 mm minimum. Ensure bolts  aligned with edge of engine mounting  . Bolts securing engine mounting to engine bracket – 100 Nm. Bolts – 60 Nm. Lubricate bolts. Nuts – 55 Nm. Lubricate nuts.